A lot of my time and efforts are spent in support of a non-profit I helped co-found called Warrior Beat. Warrior Beat’s mission is to provide therapeutic drumming to military veterans who suffer from PTSD, Anxiety, or other mental and physical ailments. It’s given me a chance to meet some really wonderful people and has allowed me to bring the arts (something that is dear to me) into the lives of people who can benefit from it. Here are a few photos from a few of the events I attended in observance of Memorial Day, 2017. Photography, court side seats and a media pass. It’s good to know people. In this case, it’s one of my best friends, Elec Simon. Elec has performed for many years as part of the cast of STOMP’s traveling show. In addition to applying his trade as a percussionist in theaters across the world, he also performs with the Cavalier’s official percussion group, the Q-Stix. I had the awesome opportunity to watchand photograph the Q-Stix during a home game at the Quicken Loans Arena (The Q, as it’s known around here). This also gave me the chance to take some photos of the players. Akron Canton Regional Foodbank's 3rd Annual Selfless Elf 5K Run! Polar Bear Jump in Akron, Ohio. Photography in a Blizzard. The weather forecast was calling for 3-6 inches of snow, the temp hovering around 33 degrees. If you’ve ever lived on the east coast, then you know it can snow even when the temp is above freezing and this can cause you a few problems. Whether it’s 36 degrees Fahrenheit , or -10 below, the problems dealing with the cold are pretty much the same; staying warm is your first-most priority. The second priority is staying dry if possible. Anything below 20 degrees and this is relatively easy. The colder the air temperature, the less likelihood the snow will melt upon landing on you and your equipment. But when temperatures get above 20, especially above 32 degrees, snow can melt on contact and ultimately effect your clothes and equipment in the same way as if you were standing in a rain storm. For the event, we would be standing on the ice, over a frozen lake, right in the middle of the action and subsequently, the weather. I took this into account and set up several shoot-through umbrellas attached to light stands to act as actual umbrellas, keeping the snow off of my speedlites and giving me a dry place to stand. When I had to change location to get a better vantage point for a photo, I would take my photo and then retreat under the umbrella and dab-dry my camera with a soft towel. This meant my camera gear was never in any real danger from water damage. Another issue with shooting in a blizzard is visibility. I had brought my speedlites so I could stop the action in midair, just as these poor folks were about to take the plunge, as well as to help equalize the exposure between the subject and the near-pure white background. Problem is, when the snow is coming down heavily and you shoot with a flash, all you’ll see is the reflected light bouncing off the snow in the air, ultimately overexposing your photo. Because of this I had to work in two modes. One mode was in shutter priority with no flash. I never use shutter priority, like never ever. But here, where I need around 1/600 of a second to get a crisp action shot, using Shutter Priority was the best bet. For this scenario I also had my ISO bumped up to 800 and my aperture around f/11 (+/- a few stops depending on the changing light). When the snow would let up a little, I would turn back to using my speedlites. I was using multiple speedlites to help spread the load so as not to overtax the batteries. The lights were TTL, unmodified, zoomed out to their max. When using the lights my camera was set at 1/200 of a second, around f/8 and an ISO of 100. 1/200 of a second works here because the flash is stopping the action, rather than raw shutter speed. You could also have used Highspeed Sync in this case, but the burden on your flashes would mean long recycle times and possible missed photo opportunities due to that recycle time. The was coming down so thick at times it was hard to even stop and look at my LCD screen to see how we were doing with the photos. The snow and water made everything on the back of the LCD blurry and I just had to trust in my own knowledge and the TTL system. I was very happy to see that the 5D Mark III’s auto focus system handled the heavy snow amazingly well. There were a few hiccups where it would focus on an area of falling snow, rather than the intended subject, but for the most part it cut through the white stuff and found the target nearly all of the time. We spent 4 hours on the ice, in the driving snow, in the freezing cold and, to be honest, I started to envy the jumpers who only had to spend 10 seconds in the 33 degree water before being whisked off to a heated tent. But the experience was fantastic. I actually like being in the snow, and there, in the middle of this expansive frozen lake, I found the setting very beautiful. It should be mentioned that it was because of my great friends at the Akron-Canton Regional Food Bank that I got the opportunity to come and take photos of this thrilling (chilling?) event. I strongly ask you to support ACRBD and other Food Banks by donating food, time, and money. It’s a great cause! Benjamin Lehman is a Commercial Advertising, Portrait, Event and Wedding Photographer in the Canton, Northeast Ohio area. When someone says, “Editorial”, it can mean several different things. For the most part, editorial means any photo that happens naturally in the moment without the photographer staging or intervening in the photo in anyway. When I am shooting a wedding I’d suspect that nearly 95% of of my photos are shot in an editorial manner. The last 5% are things like formals where the photographer needs to work hand in hand with the bridal party and family in order to get all of the expected photos. Before any wedding it’s not uncommon for the bride and groom to prepare in different areas or even completely different venues. For Jim and Leslie’s wedding this meant I would be at 3 different places throughout the day. It started in the early afternoon with the groom and the groomsmen getting ready at the Hilton. The day was overcast, and the room was lit naturally with a large window on one side of the room. The room itself was painted a soft beige on every wall, including the ceiling. These types of situations are always tricky when trying to find your white balance. The best bet would be to set your camera to tungsten – this will help immensely since the colors of the walls will even influence the color of your flash into a warm tone. The second location I visited was where the bride and her bride’s maids were getting ready, The Bertram Inn at Glenmoor estates in Canton. This location is gorgeous. The Inn itself has a wonderful style to it, a very late 1800’s industrial-age-elegance. The room the bride was preparing herself in was a large suite, soft blue-ish green walls, a large white ceiling and several windows letting copious amounts of natural light in. This was the perfect room for pre-wedding/getting ready photos. For the formals, my first choice was to use the attached Chapel, and while we were promised by the staff that it would be available to us for photos, we were disappointed to find out that it had been filled with empty tables and broken glass – and since it’s not kosher to have your bride walking through broken chandelier bulbs, I had to move quick and find a second location for formal photos. Luckily the front of the Inn turned out to be a perfect replacement location. We got lucky and the sun started to peek out of the clouds in the distance, which added warmth, and there was still enough cloud cover that the light remained even over the subjects. In total this provided beautiful, natural light conditions. Once formals were done, we headed to the wedding venue; La Pizzaria, a beautiful, upscale eatery here in Canton. While the outside of the venue is fairly nondescript the inside, however, is a beautiful, open space with wooden walls and a concave ceiling, painted and lit to look like a spring sky. Wooden walls usually mean you’re in for a lighting nightmare. Trying to bounce light off of shiny, dark materials can prove near impossible. However, I knew I could use a tall light stand and hoist one of my studio strobes into the channeled ceiling and still get good light coverage where I needed it without having to worry too much about color balance issues. The wedding itself was an exquisite affair with both the wedding party and guests filling the room with excitement and smiles. It’s always fun for me when I get to live and document a day in the life of wonderful people and this wedding was just such an experience – something I’ll cherish and remember forever. Benjamin Lehman is a Commercial Wedding, Portrait and Advertising Photographer in the Canton and Northeast Ohio region. I was tickled when the Hall of Fame asked me back this year to cover the events of their 2014 Pro Football Hall of Fame Enshrinement. Enshrinement week covers a lot of activities and from start-to-finish, but the total event last nearly a month. It starts with several smaller festivals in the Canton, Ohio area – fairs, hot air balloon lifts, food-festivals and fireworks all happen throughout the month. The last week covers the events directly related to the Enshrinements. Those events are dinners, activities for families and visors to the HoF, ceremonies, and the Hall of Fame game that kicks off the year’s preseason. My task was to cover the events that happened inside of the Hall of Fame and the VIP parties. It’s a wonderful job with thousands of opportunities for photographs; portraits of football stars, photos people having fun, and landscapes of beautiful events. Below are a handful of photos taken from this year’s event. Benjamin Lehman is a Commercial Event, Portrait, Wedding, and Advertising photographer in the Northeast Ohio Area. Shooting action shots, at night, with available light used to send photographers to the highest ledges – talking them down could be a tricky proposition. We all know that low-light and action photography don’t really go hand-in-hand. Modern digital cameras have opened up the field for low-light shooting, but a lot of photographers are reticent to push their ISOs above 800, let alone 1600. The noise you have to deal with once you reach ISOs of 1600+ can make you feel like the picture won’t be worth it in the end. Labeling a noisy picture as worthless, I think, is a misnomer. Noisy pictures (we’re talking ISO noise here) are as good as any other picture you could possibly take given the circumstances of available light and the speed of the action in front of you. There’s never a reason not to resort to turnin’ the dial up into the thousands if that’s the only way you’re going to get the picture you need to take. Along with camera sensor improvements, there are wonderful new software tools that can reduce noise and turn a grainy picture silky smooth – ready for print. Not to mention a little ‘grunge’ in your photo is a bit en vogue at the moment. Think of how many photos you’ve probably taken at 50 or 100 ISO that you later processed with a little film grain to boost its mood? A little noise is a good thing, and when it’s your only option, embrace it. Below are a few photos I took at a stunt bike show. It was so dark out that the riders had to move some lights around so they could see their own ramp. Regardless of the low-light conditions I was still able to snag some moody and sharp images by balancing my shutter and ISO, (aperture was wide open, obviously). What about the noise? Well, you should be able to tell in the photos below that it wasn’t much of an issue. One trick to remember is that ISO noise lives in the mid-tones and shadows. If you overexpose by a stop or 2 you’ll actually reduce overall noise, even if it means you’re actually dialing up the ISO a few more notches to achieve over exposure. 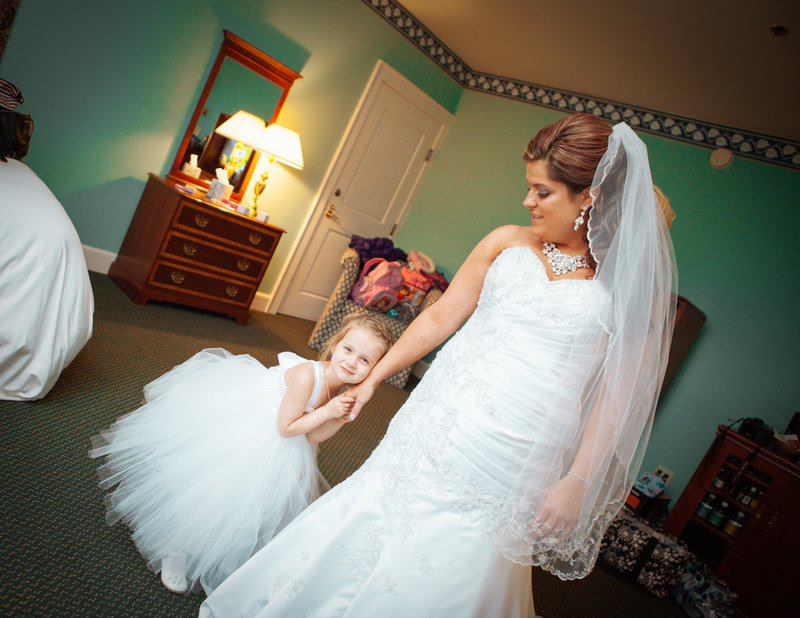 Benjamin Lehman is a Commercial Wedding, Portrait and Advertising Photographer in the North East Ohio area. 70-200mm lens, 600ex-rt flash on camera, and a 430exII inside a flashbender would be my equipment for the night. That was my issue yesterday when I was asked to shoot a live band performance for some friends. It’s a venue that I’ve shot at before, and I remembered it really wasn’t a great place for photos. First off, it’s cluttered and the stage is small. There’s no place to swing your lens where you won’t catch some sort of unflattering background element bleeding into your pictures. That told me right away that I would be shooting tight. No fisheye, or 24-70mm here. I would be shooting long all night, 70-200mm and I would be focusing on individual performances to tell the story. Next, because I knew the light was limited (read: non-existent) I would have to bring some of my own lighting solutions to help me out if I wanted to shoot anything other than frames of pitch black. The venue, while not too small, is usually packed to rafters, or drop ceiling as the case may be, so I also had to pack mobile and take equipment that wouldn’t get in anyone’s way. 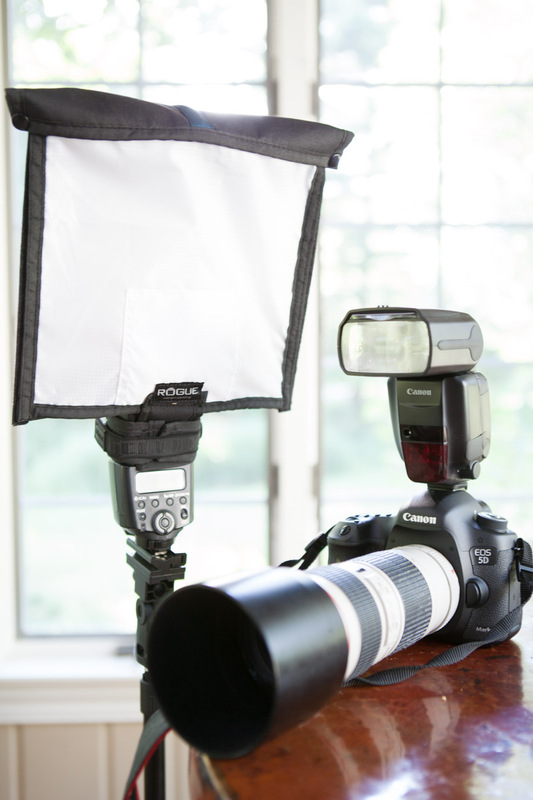 I choose an on camera speedlite (600ex) and a second flash on a small stand (430exII) with a Rogue Flashbender modifier. I’d use the on camera flash as a bounce light. I could take just the one speedlite and point it directly at the subjects but we all know what that looks like – mugshots. Add to that the fact that people sweat on stage and they would look like mugshots taken after a high speed chase – not a good choice, so bounce flash it is. I’d use the flash on the stand in many different ways; I’d use it as a fill, a kicker, back light, rim light – pretty much anyway I could to squeeze out a good looking photo. When I arrived to the venue any small hopes that I had left for the shoot were quickly thrown out of the window. The stage light, which I were told were, “Totally awesome, man.”, were turned in such a way that they only lit the audience. THE AUDIENCE! I don’t know who made that decision but it wasn’t me. There’s was nothing I could do about it either. The lights were so bulky, their foot print so huge, that moving them was completely unrealistic. So, now I literally have no light pointed at the stage, my speedlites were going to be doing all the work. This also forced me to make an important decision about the artistic direction of the shoot. My first thought was I could slip out the back without anyone noticing me and just go home where I could make up a story about a falcon stealing my gear earlier in the day, but these guys were my friend and they were relying on me to take some photos. Also, the story was pretty lame and I am sure almost no one would believe me. So I soldiered on and came up with a realistic solution. The effects of shutter drag, on the left side of the picture, where the ambient light let’s the motion draw through the photo. My final plan was to portray motion. I’d use my speedlites to stop the action, but then I would drag the shutter (slang for using a slow shutter speed) to let the action trail through the frame. One great side effect of a packed house means that people would be using cell phones to shoot their own videos. And since it was so dark, all of those cell phones would most likely have their little LED lights blazing, and that’s exactly what happened. Those little LEDs gave me just enough ambient light to let me use the slower shutter speeds and actually capture some movement. You can see in the photo here just how this works. 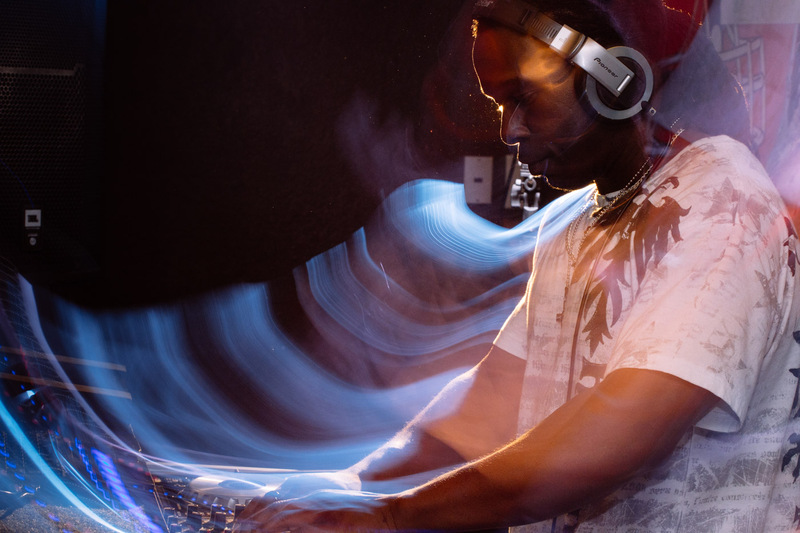 The on-camera flash (zoomed to 200mm and pointed straight up at the ceiling) freezes the action on the right side of the photograph, while the ambient-only lit left side of the photo makes motion trails as the musician plays. The final effect is pretty cool and gives the viewer the sense of what the subject is doing in the frame. Here, with D.J. Kob, we can see that his arms are all over the place during his performance. Note the thin orange outline of light around his face and arms – that’s my other speedlite on a stand with a full cut CTO gel positioned right behind him to help him pop out of an otherwise black background. The last hurdle was focusing. We’ve all come so reliant on auto-focus that it can really throw you off your game when no-light conditions render it useless. There are some tricks you can use to manually focus. First tip is simple – shoot a lot more frames. Without auto focus your chance of getting a razor sharp picture drops through the floor, so shoot a lot and hope for the best. The next tip is to look for small reflections on your subject that you can manually focus off of. Glints in eyes, sweat on foreheads, jewelry. Anything that catches light is your friend. Just focus on those objects, turn the focus ring until you can see that they are sharp and start shooting. It’s all you can do. If done right, you’ll have a set of compelling, artistic photographs that tell a story and convey motion. Shutter drag can give you some cool, ghosty artifacts that add a lot of character. Benjamin Lehman is a Commercial Portrait, Wedding and Advertising Photographer in the Canton, Northeast Ohio area. 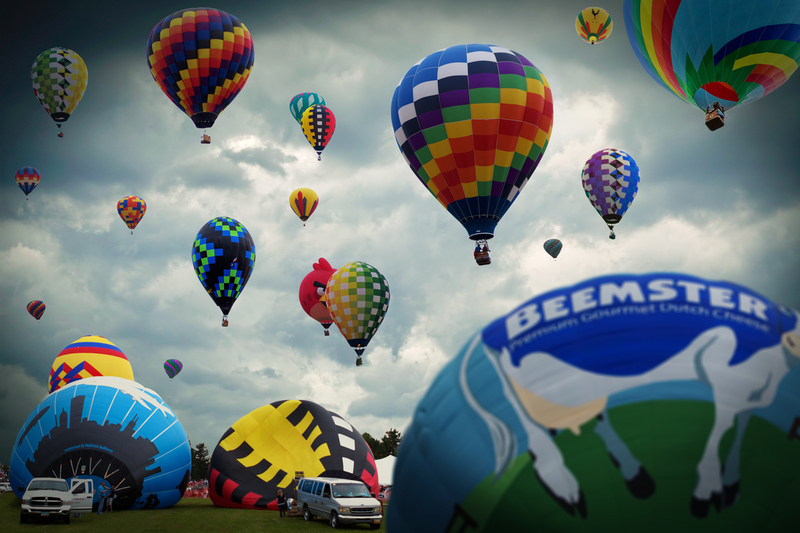 Edit: 7/23/2014 – More Awards added for my Balloon Liftoff Photograph! When I moved from San Francisco to Canton the challenge was made to find things, people and events to put in front of my lens. San Francisco is a feast for your camera. In most areas of the city, every direction holds a great picture waiting to be captured. Canton, and Northeast Ohio is a different type of beast. There are pictures to be found here too, you just have to seek them out, rather than having them come to you. San Fran taught me to love photography, but North East Ohio has taught me how to be a better photographer. Smiing faces abound at the Jackson-Belden, Hall of Fame festivities. One of these photographic searches lead me to the Foodfest, Balloon Lift Off, and Hall of Fame fireworks that’s held every year at Kent State University’s Stark county campus. It’s the perfect event for photographers. It has a slight carnival feeling to it. Food vendors line the streets and field. People from all walks of life mill around the attractions. There are VIP venues that hold smiling faces and wonderfully prepared food. As evening starts to creep in, one of the large fields there becomes home to hundreds of trucks hauling their cargo — hot air balloons. The Balloon Lift Off is the highlight of the weekend’s festivities with balloons from all over the nation converging to celebrate the kick off of the Pro Football Hall of Fame’s larger enshrinement celebrations. In the 5 years I’ve lived here I’ve never caught an actual lift off – the weather has always been to windy or wet for safe balloon flying. With the weather this year being a little windy and very cloudy I feared I’d have to wait another year for a chance to actually see these things soar. So I was rather caught off guard, left scrambling back to the car for my tripod, when I noticed a balloon lofting over a hill – ack! Time to move! I got my tripod and raced back to the field, where to my relief, most of the balloons were just now being unfurled. Thanks to that one balloon’s early liftoff I knew which direction they would be traveling, so I set my camera up and just waited for the moment when the sky would start to fill with airships. The moment came near the end when many of the balloons had already drifted off into the distance. I framed my shoot and hit the shutter. BAM! I was so happy with the result, and apparently others were as well. Earlier today I noticed my inbox was filling up with new friend requests from Flickr. On closer examination my photo had been selected as the explore/photo of the day honors, wow! The comments left for me were both flattering and humbling and stood as a wonderful cap to an exciting and delightful night. The celebrations end the next evening when the Hall of Fame hosts a fireworks show on the same field that held the balloons. It’s always a wonderful way to cap off the weekend and it’s something that I’ll always look forward to shooting in the years to come. It’s one of those times where searching for a photo can lead to a new, unique experience that will leave you smiling, and a better photographer. I had the great pleasure and honor to be the wedding photographer for Jesse & Chris. The ceremony was at Saint Joseph Catholic Church in Massillon, Ohio. The wedding was exceptionally fun for me because it presented me with a few creative challenges — which, by the way, is something I truly love. Unique obstacles are a great way to improve creativity in a new situation, and the lessons you learn under these circumstances can be taken with you into the next photography project and put to great use. For this wedding, it was a very compressed time-frame. The Bride & Groom would be showing up only an hour before the ceremony. The real catch, however, was that there was a service being held in the church that was scheduled to last 15 minutes into that hour. That would give me 45 minutes to set up lights, photograph preparation, candid and detail shots; all of which no wedding should be without. I realized the day before that this was more a test of my own personal speed and aptitude rather than a test of my ability to come overly prepared. I loaded all of our gear into the car as usual and readied myself to move like the wind once the parishioners had filed out of the church and that’s exactly what I did when I arrived on the spot. Read on about my adventures below the video.